Ligustrum obtusifolium.Matthew C. Perry.en.wikipedia.org. (Accessed 5/2014). 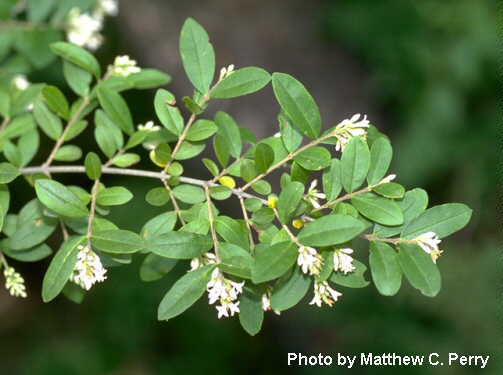 Ligustrum obtusifolium is a shrub to 3 m tall, branching opposite, young stems finely hairy. Leaves opposite, stalk 0.1-0.4 cm long, hairy; blade elliptic to oblong, 2-6 cm long tip pointed to blunt, base wedge-shaped, hairy below, or only so on midrib. Flowers white, to 1 cm long, numerous; inflorescence 2-3.5 cm long, branched, nodding. Fruit fleshy, 0.6 cm, rounded, black. Origin: China, Korea, and Japan. Habitat: Mostly horticultural, sometimes escaping.